Ever wonder how much juice it takes to move water? Explore the Water and Power series and hear Dan’s story on KQED’s The California Report. When you open that faucet, it’s more than water that’s flowing. A few years back, number crunchers at the California Energy Commission tried to add up how much electrical power (and other forms of energy) goes into using water in California. The bottom line number they came up with: 19%. That is, nearly a fifth of all the power generated in California — as well as huge quantities of natural gas and diesel fuel consumed in the state — goes into water-related uses. You might call that report, entitled California’s Water-Energy Relationship, as The Great Wake-Up Call. The idea that so much power could go into this one vital activity—moving and treating and using water—is both stunning and captivating. And it has spurred both state agencies and water and power utilities into action. The California Public Utilities Commission, responsible for overseeing the activities of the state’s big investor-owned electric utilities on one hand and numerous small water providers on the other, responded to the 19% number by authorizing a series of pilot projects to assess how to cut the amount of power used in connection with water. Since the CPUC is supposed to make sure that utility investments are cost-effective and don’t burden ratepayers with excessive charges, the focus of most of the pilots was on areas where utilities could get the most bang for the buck. Mostly, that turns out to be water conservation. 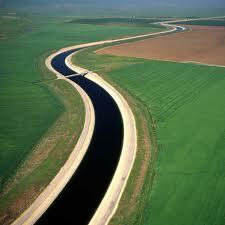 The California Aqueduct moves water from Northern California to Southern California. The logic for that is pretty straightforward: Water is heavy (62.4 pounds per cubic foot) and tends to resist moving uphill. It takes a lot of energy to move water, but also to treat it, and then treat it again after we use it. If you use less water, you move and treat less water, and you use less energy. The pilot projects ranged from installing high-efficiency toilets and low-flow shower heads in a jail to high-tech systems to manage landscape irrigation, to new methods of closely regulating pumping operations to minimize power consumption. In fact, the effort has led the CPUC to dive deeper into the water-energy nexus. One preliminary finding: The California Energy Commission’s oft-quoted 19% “power for water” number is likely an underestimate (among other findings, the CPUC says a lot more power is needed for pumping groundwater than previously known). And in a decision adopted last month, the commission recognized the water-energy nexus as an area for big potential power savings and invited utilities to submit new project proposals. I live at the top of Grizzly Peak Blvd in Berkeley and pay a double surcharge to have the water moved 660 vertical feet up the hill. So it makes sense as just the transporting of water around the state is going to take a lot of energy. So I’m guessing that my electric bill will also go up along with the water, or in my case, the water surcharge to move that water up the hill. Time to focus on water conservation (mandate high efficiency toilets and fixtures) and putting a solar panel “hoody” on the California aqueduct which loses water to evaporation. Tom, don’t know if you heard our story this morning–it featured that very same vertical climb. I had no idea residents up there pay a surcharge (let alone a double surcharge) related to the elevation. In rough numbers, how much do you pay per month? PG&E charged $0.12233 per KWh to Davis customers in Jan. 2012. This indicates that the customers who live on a location of 600 feet higher above the flat ground should pay at least by $0.27 per 100 cubic feet of water used. Of course, there may be other cost (water distribution, extra pipelines, etc. ; plus profit?) involved which is about 16 cents per 100 cubic feet. ($0.43 – $0.27 = $0.16). Moving, treating, and disposing of wastewater takes about 7% of the State’s electricity and about 1/2% of the State’s natural gas. The rest is used on the customer side of the water meter. Much of the water delivered is a NET generator of electricity as it flow down from the Sierras to the point of use. These numbers come straigh out of the final report. Still a great amount of use but far from the 19%. Pswan: Good point here: The latest overall estimate of the amount of electricity consumed in California to go into agriculture and water pumping (moving and treating water and getting it to end users), is in the 7.5 percent to 8 percent range. The rest of the number is for end uses. Still, that’s on the order of 21,000 gigawatt hours, which is a lot; substantially more than many (poor) nations consume for ALL uses. I think it’s great to help us understand how water usage consumes energy, and therefore contributes to global warming. Your current communication is confusing to me. It would be better if you focus on the energy required to get the water to my house, rather than the “water related energy use”. I think you’re saying that 19% of California’s total energy consumption is water related. And, for example, 28% of this 19% is Household/Residential. But this 28% includes running the electric motor in the washing machine. You’re including this because the washing machine is water related. But if I reduce my water consumption by replacing my lawns with low water plants, this will have no impact on the power used by my washing machine. Also, in the audio report, I heard that California’s energy consumption due to the movement of water is equal to the power consumed by Las Vegas. Is this the 19% of water related energy consumption, or is it 22% of the 19%. Thanks for the informative piece, and what will be a helpful dialogue. I assume this level of demand is also why DWR staff played a central role in the renegotiating of the power contracts after the electricity market went sideways in 2000-01 (i.e., they had the experience). A minor detail: the unit is cubic foot (not square foot). I think it is a great series–very informative and clear. I’ve shared it with many others. Thanks for the excellent work & needed public info. And for those of you who jumped on the square-v.-cubic foot gaffe: don’t blame Dan. That would be his overtired editor (moi) who added that parenthetical at the last minute before posting. Next time I’ll leave well enough alone! OK, let’s see if I get this right… 15% goes to farm use, and 22% to moving water. But out of all the water we move, I believe 80% of that goes to farm use – so around 1/3 of the 19% power consumption would be attributable to farm use – correct? Mike: If only it were as straightforward as that. Right now, the studies don’t do a great job of detailing those numbers and there’s a lot of work going on regarding pumping efficiency both for long-distance shipment and for groundwater and irrigation. One thing to keep in mind is that not every acre foot of consumed water is created equal. For instance, farm water is less energy intensive than municipal/industrial water because it doesn’t need treatment before it’s used; also, the kind of treatment it gets after it’s used (if any) is likely to require less power. LOL Dan, of course nothing about our water is straight forward, this is CA after all! None the less, 80% of our developed water state-wide goes to agriculture, and from what I understand, somewhere around 2/3 of all the water we pump south via the State & Fed viaducts also is used for Ag. I’ve been looking for the energy use of all that for a long time now, and it seems someone is finally making some baby steps in the right direction. But, yes – this study is somewhat confusing because it incorporates (somewhat capriciously in my opinion) all kinds of other energy usage (heating water, treating water, etc..) instead of just concentrating on the water itself. Then of course it gets really complicated when we pump water uphill just to let it run downhill later to power up the turbines for the 5-o-clock news at a great energy loss, but one we need to accomodate our lifestyles. I’d be happy enough just to have data on annual energy used at the Tracy pumping stations. Not true, this is per cubic foot. 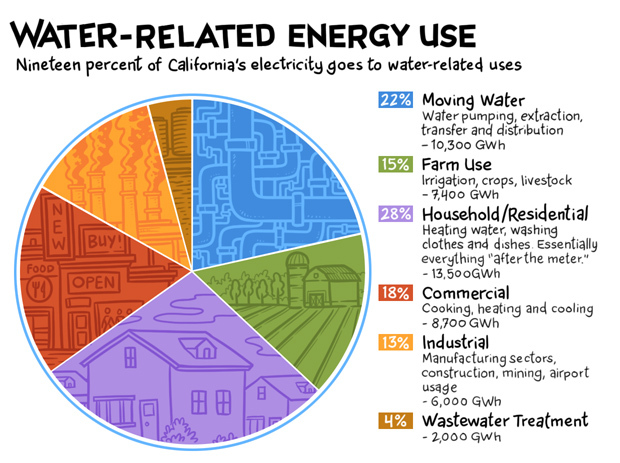 Interesting the amount of energy related to water use. Let’s look at two two aspects of this. In looking at these numbers I see that 28% of 19% or 5.3% of energy use is residential/home use. Most of this will be for heating water. So for the total energy use in a house, while saving water is a good thing, saving it to reduce one’s energy use, will not save us very much compared to other energy usage in the house. The other point is that the energy in water use varies greatly due to geographic location. The water for much of the peninsula bay area comes from the Hetch-hetchy water system and is probably energy positive as it is a gravity fed system and actually generates electricity on its way to our tap. This will be very different for any water use in southern California where water is pumped over tall mountains before it is used. Just as the CO2 content of electricity generation varies by region, so does the energy content of water. Dan Brekke is a blogger, reporter and editor for KQED News, responsible for online breaking news coverage of topics ranging from California water issues to the Bay Area's transportation challenges. In a newsroom career that began in Chicago in 1972, Dan has worked as a city and foreign/national editor for The San Francisco Examiner, editor at Wired News, deputy editor at Wired magazine, managing editor at TechTV as well as for several Web startups. Since joining KQED in 2007, Dan has reported, edited and produced both radio and online features and breaking news pieces. He has shared in two Society of Professional Journalists Norcal Excellence in Journalism awards — for his 2012 reporting on a KQED Science series on water and power in California, and in 2014, for KQED's comprehensive reporting on the south Napa earthquake. In addition to his 44 years of on-the-job education, Dan is a lifelong student of history and is still pursuing an undergraduate degree. Prev Amping Up Local Renewable Power Next New Study Projects More Frequent Fires for the Western U.S.